Bruno Donzelli was born in Naples in 1941. Since his young age he distinguished himself in the italian artistic scene. He had important personal exhibitions in famous art galleries and he received lots of prizes. At the end of the Sixties his attention moved towards “fantastic themes”: his artworks were carachterized by dinamism, typical of expressionism, and a certain irony. From the beginning of the Seventies the artist focused his attention to revisiting the pictures typic of the Avant-gards of our century. He produces not only unique pieces but also limited editions and ceramic artworks. During the eighties the artists improved his art after a period of conceptual and minimalist researches. In the following years he exponed in several and important cities both in Italy and in Europe, among which Florence, Milan, Rome, Genoa, Venice, Turin, Paris, Geneve, Dusseldorf, Nice, Koln, Basel and others. In 2008 he made some expositions abroad and overseas, in Miami, New York and Shangai. 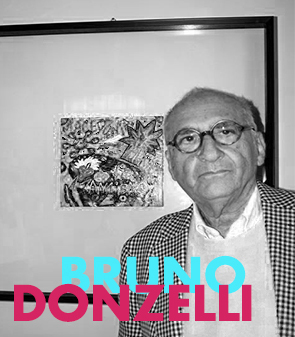 During his entire artistic path, Bruno Donzelli has been able to develop a personal and recognisable artistic language. His art is charachterized by lightful colors and lively shapes. He is considered one of the main interpreters of a new expressive language, which has revitalized the pop art with new and contemporay chromatic expressions.